From the Back to Basics article in the May 2017 issue. In high summer in New Mexico, people eat this sauté by the bowlful. 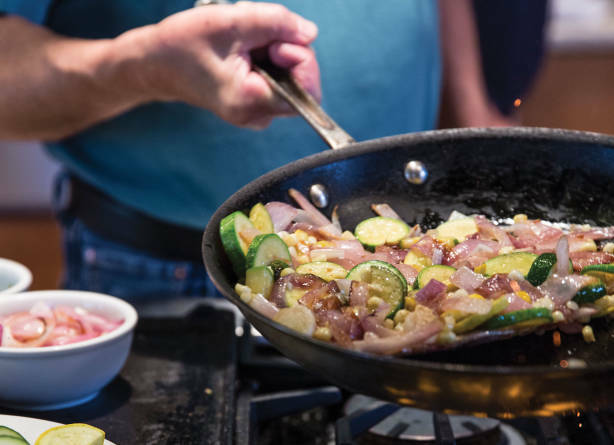 The preparation for calabacitas is fast, easy, and forgiving of additions and subtractions of ingredients.Just don’t rush the cooking, because the squash should be quite tender when done. Warm the butter and oil in a large skillet over medium heat. Add the squash, onion, and optional tomatoes. Sauté for 10 to 15 minutes, until the squash is well softened. Stir in the corn, chiles, and salt, and cook covered for another 10 minutes until all vegetables are tender. Pour in the half-and-half if you wish, and simmer briefly, until the liquid is reduced by about half.